Everyone knows there must be gold scams. Gold buyers seem to be right down there with used car salesmen when it comes to reputation. If you have ever been to a scam gold buyer, you know what I am talking about. 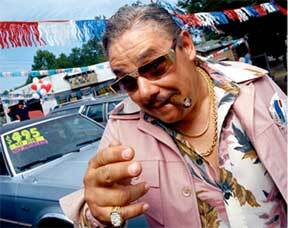 Getting out of a scam gold buyers store is like getting a starving insurance agent to leave your home without a sale. Having been in this business for several years I have heard of hundreds of gold scams from my customers. Fortunately many of them walked away from the scammer as they realized something wasn’t right. Here are scams that gold buyers have used on my customers. This is a favorite of scam gold buyers. They will weigh your gold out of sight and give you a false weight. You must see the scale. Some gold buyers have been known to weigh in pennyweights and tell you the pennyweight number was grams. So a 4.6 gram necklace would be 2.96 pennyweight. If you were unaware of the gram weight you just were cheated out of 1.6 grams of gold. This scam is simple. Their ad says we always pay the highest price. Then they have a 20% more coupon running. With the competitiveness of the gold business, it would be impossible to always pay the highest price and give a 20% bonus. They would be bankrupt in a week. The gold roadshows whiz into town with newspaper ads full of rare coins. Trust me, you don’t own those coins. They promise great deals, but have been proven to start payouts as low as 8% of your gold’s value. These guys are despicable. You bring in an item, they pick it up, toss it down, and say “I’ll give you 50 bucks for it.” They did not test it. They did not weigh it. Their offer is guaranteed to be 30% to 50% below value. Gold is sold in Troy ounces. Grams is the proper breakdown of a troy ounce. Pennyweights are an old English system of weights used because the consumer has no idea what a pennyweight is. I thought I had seen all the scams my local competitor had to offer, but this one is out and out fraud. A knowledgeable gold buyer has a responsibility to tell you the truth about what your metals are. A lady brought in White Gold Jewelry. He told her it as silver. It was 18k white gold. Watch the video below to see the details. This is why you need to examine you items for karat marks. Scam gold buyers love to tell you that your 14k gold is 10k gold. You need to see the gold buyer testing your gold item by item. That’s an easy way to scam $5.00 to $6.00 a gram from you! I realize that the majority of the people reading this page are selling gold, but there are gold scams you need to be aware of as a buyer. If you are investing in gold coins, here’s a major scam to avoid. Some gold companies who advertise on TV and radio have boiler room salespeople who will try to convince you to buy old numismatic collectible gold coins. They will liberate you from $7,000.00 a coin. Sad thing is the real value is $2,000.00 per coin. My opinion is: If you are investing in gold coins; buy well known bullion. I recommend American Gold eagles for spot, plus a small markup. Always take physical delivery. Only deal with reputable dealers. Buy locally if at all possible. The best way to avoid gold scams is to bring your gold to an Honest Gold Guy. I will test your gold as you watch. I’ll weigh it on a State Certified Scale, and give you an immediate appraisal of your gold’s value. I love giving second opinions. If you feel like a gold buyer is scamming you, call me to find out. If you need to sell gold jewelry, silver, platinum, coins, or any precious metals, stop by my Gurley street location or call Greg today at 928-710-2137. I’ll meet with you on your schedule.